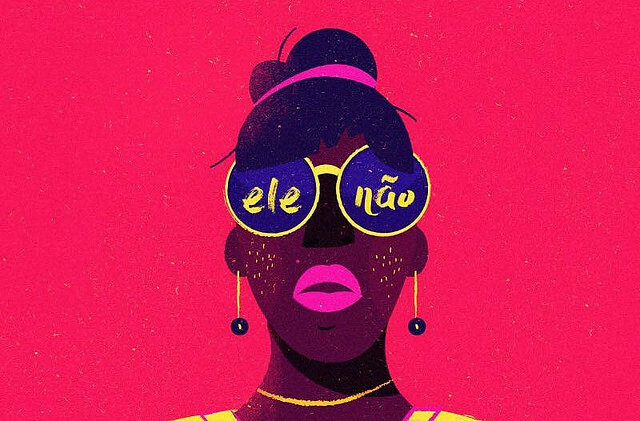 The voices of more than three million Brazilian women, who first started to organize on Facebook, will become a shout of resistance on the streets of Brazil and the world. With that in mind, the women’s collective released a manifesto against far-right presidential candidate Jair Bolsonaro. The statement points out how diverse the group is and includes a detailed list of the reasons that have led Brazilian women to spearhead the democratic resistance against fascism and the rise of hatred. One of the main reasons they point out is the fact that Bolsonaro supported the country’s Labor Reform, which made workers more vulnerable. The far-right presidential candidate also advocates for a failed model of security that only leads to the genocide of black youth, unapologetically discriminates against LGBT folks, constantly makes misogynistic remarks, and outspokenly supports the military dictatorship that ruled the country between 1964 and 1985. As women mobilize, opinion polls show Bolsonaro is becoming increasingly unpopular, and now 46 percent of responders would not vote for him under any circumstances. In addition to the manifesto, women are also posting safety guidelines to take part in the demonstration against Jair Bolsonaro. Read the manifesto below, as women call #EleNão (“Not Him”) and #EleNunca (“Never Him”). For equality, liberty, right, and a violence-free life! We’re millions of diverse women. We’re Brazilian and immigrant women. Young and gray-haired. Black, white, indigenous. Trans and travesti. We’re LGBT, we love men, women, or both. Married and single. Mothers, daughters, grandmothers. We’re workers, homemakers, students, artists, public workers, small businesswomen, street vendors, homeless, landless women. Employed and unemployed. Women of different faiths and no faith. Today, we are together with our heads held high on the streets of Brazil, because a presidential candidate speaks based on hatred, intolerance, authoritarianism, and backwardness. He threatens our achievements and our existence, which is not easy as it is. We are taking to the streets because his economic and political platform is a setback, an aggravated copy of [Michel] Temer’s terrible policies. Jair Bolsonaro, currently a member of the PSL, has been a congressman for 27 years and has joined and quit 9 parties before. In his entire political career only two of the bills he proposed were passed through. He claims to be “new”, while in fact he is just another “professional politician” who has worked to elect his sons [for local, state, and federal congressional office] and enjoy privileges, such as the immoral housing allowance, while thousands of families are homeless and fighting for a decent, dignified place to live. Why do we stand against Bolsonaro? 5. His running mate is a General in retirement who defends the Army should take over power and draw up a new Constitution without people’s participation. It is a ticket that outspokenly puts democracy at risk! Jair Bolsonaro supports the Military Dictatorship, arguing the military leaders’ mistake was to torture instead of killing; he is also an unapologetic admirer of the most infamous torturer of the 1964-85 military regime, General [Carlos Alberto Brilhante] Ustra. We do not want a dictatorship or fascist rule, nor do we want more killings by military police officers on the streets, promoting the genocide of black youth. We want liberty, equality, social justice, and rights! Bolsonaro is everything Brazil does not need to overcome the crisis and move forward. We, diverse, united women, defend the opposite of what he stands for: we defend respecting differences; women’s right to live a safe life and make decisions over their own bodies; we defend equal pay between men and women, black and white; we defend quotas in favor of those who have historically been victims of injustice and damages; we defend quality public services for poor women and their children. We defend complete freedom to teach and learn, with no gag laws, in schools and universities. We defend people are free to love and be respected for that. We defend a conversation about ideas and democracy. He preaches hate, we preach respect. He advocates for death and torture, we advocate for life. And so we say: Not him! Or his sons! Never Bolsonaro! No Fascism!"